The two cartridges we are going to look at in this article, the .357 vs .44 Mag, are steeped in American culture and tradition. They both also serve some of the same shooting niches including hunting and self-defense. In this article, we will take a look at these high velocity and hard-hitting handgun cartridges by comparing certain ballistic and other performance categories. 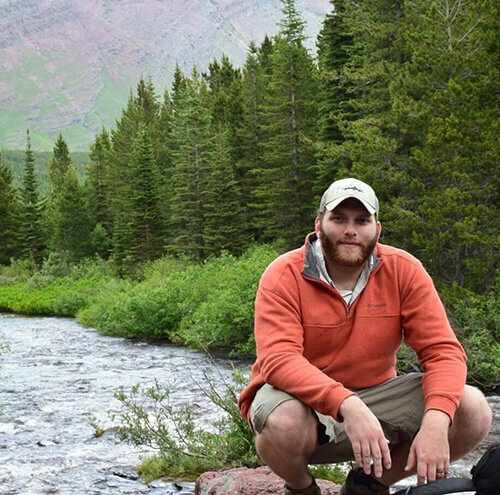 What we hope to do is outline the similarities and differences between the two to better understand what situations and applications both cartridges will excel. We will take a brief look at the history of the two cartridges, compare performance specs using several rounds of each cartridge, and then wrap the article up discussing how their performance translates into using them in certain situations. The .357 Mag’s origins begin in the early 1930’s where the police force was in desperate need of a better terminal performing handgun load. From the .38 special, modifications began to be made by Phil Sharpe, Elmer Keith, and eventually the guys at Smith & Wesson. What came from these modifications is the round that is still in use today, the .357 Mag. The .357 Mag was a handgun cartridge that provided unrivaled velocity and terminal ballistic performance at the time. Hundreds of different firearms have been produced since the cartridge’s introduction to the shooting world that vary in length and weight. The .357 Magnum is also used in carbines that are better served for hunting purposes. The .357 Magnum today is a favorite of handgun connoisseurs with its rich history, home defense with its excellent terminal ballistics, and hunters as well. The variety of .357 Mag rounds allows the shooter to match his ammunition well with the task at hand. The most common .357 Mag bullet weights range anywhere from 120-160gr and come in designs that range from deep penetration to rapid expansion and fragmentation. The .44 Remington Magnum or .44 Mag for short was introduced to the shooting community in 1956. The origins of the .44 Mag come from the .44 Special that was tinkered with by Elmer Keith to provide more velocity and energy to the heavy bullets used. Eventually, Smith & Wesson and Remington began commercially producing these custom rounds and producing firearms that were chambered for the cartridge. From that point, the .44 Mag has been a cornerstone in American handguns and even in American culture. While it has been eclipsed by newer cartridges, the .44 Mag still offers extremely high velocities and energy from handguns. These specifications gave gun owners the option for a hard-hitting and deep penetrating handgun cartridge, and that remains true to this day. Like the .357 Mag, the .44 Mag can also be used in carbines chambered for the cartridge and is a great option for hunting purposes where the recoil will be less severe. The .44 Mag can accept and propel much heavier grain bullets than the .357 Mag. Bullet weights can range from anywhere from 180 to 300gr. There are even lighter and heavier bullets for this cartridge though they’re availability is more limited. The .357 Mag is a much smaller diameter bullet than its .44 Mag counterpart. 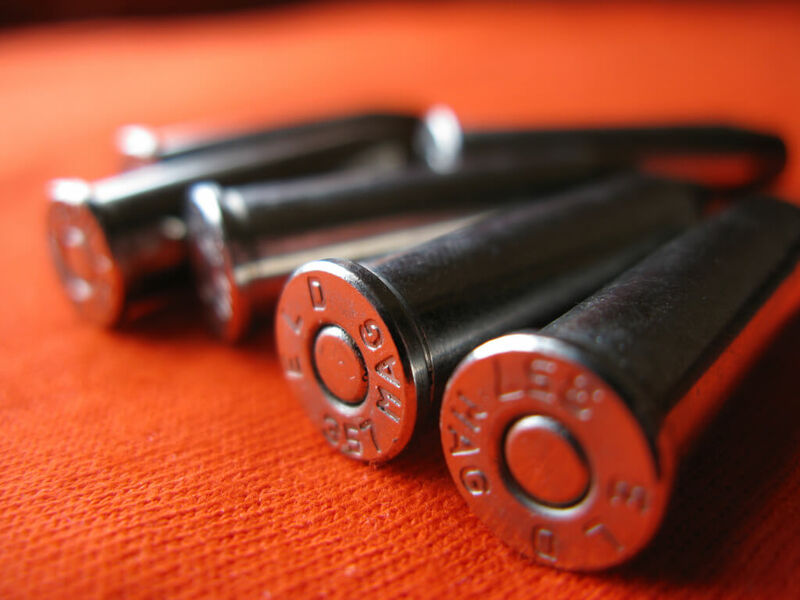 While the case and overall length are similar, the .44 Mag is much wider and voluminous cartridge that can hold more powder and withstand a higher amount of pressure when the powder is ignited. As you can imagine, this is most likely going to result in pretty different ballistic and terminal performances between the two different cartridges which we will look at in detail shortly. The increased neck diameter also means that the .44 Mag is going to hold bullets at much heavier grains than the .357 Mag as you will see just below where we have listed several rounds for each cartridge. To look at the ballistic and other performance characteristics, we have chosen five factory rounds for each cartridge that covers a range of bullet weights and designs. Below, we have listed these rounds. 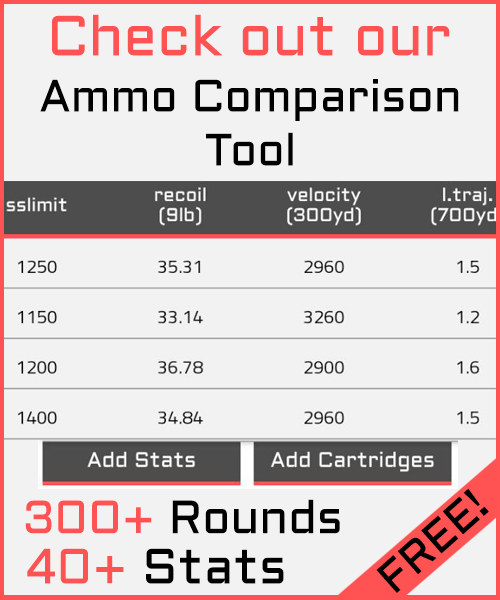 The data that we are using for our ammo comparisons comes from ballistic calculators as well as from the manufacturer of each round. Because it is computer generated, we are confident that the comparisons will be sound, but these numbers are not engrained in stone. While they should remain relatively close, some numbers may vary when these rounds are fired from your handgun. And though the numbers might differ when being fired from your handgun, the differences between each round from both cartridges should remain constant. Recoil with handguns, especially for those to be used for personal defense, is a very important concept to think about before choosing a handgun chambered for a specific cartridge. You want to be able to squeeze off several rounds in quick succession while maintaining a semblance of accuracy. Both of these cartridges are known for their power and associated recoil. The barrel length, grip style, gun weight, and of course the ammunition used all influence the amount of recoil. We do want to note before we move on how exactly we came by these numbers and what they mean. We are looking at the actual energy that is generated from firing these rounds and not technically the actual felt recoil. We used a ballistics calculator and added the weight of the bullet, muzzle velocity, powder charge (which we acquired from Nosler load data), and the firearm weight. We kept the firearm weight constant for each round as well as the powder charge for rounds in each cartridge. We also went pretty conservative with the powder charge since these are factory loads. Because of this method, the comparisons should be valid, but as we mentioned earlier, the actual numbers could change depending on the firearm you are using. The “felt recoil” will vary even more so depending on the weight and the barrel length. Barrel length is especially important with these two cartridges where barrel length can vary pretty widely from gun to gun. A snub nose for either of these cartridges is going to have significantly more kick than a handgun with a 4” barrel. While both of these cartridges are known for their ability to stop intruders in their tracks or even to take down some larger game, every action has an equal and opposite reaction, and in this case, it is recoil. 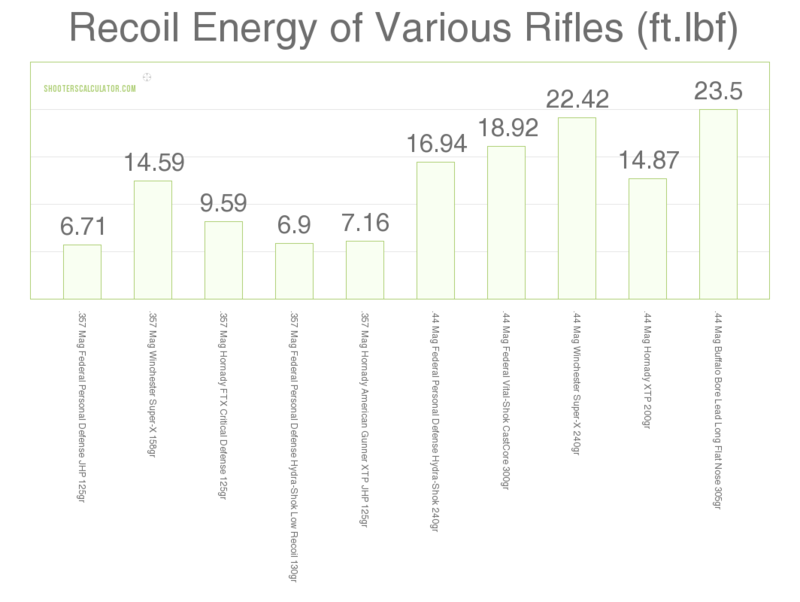 So let’s take a look at the recoil energy that is generated from these cartridges. What stands out is the large increase in recoil energy for the .44 Mag over the .357. For several of the rounds, the .44 Mag shows over double the recoil energy. The .357 Mag round is still slightly less than the .44 Mag round with the least amount of recoil. Now, we have chosen several hard-hitting .44 rounds, and there are options out there where the recoil is not as severe as the rounds we have chosen, but the trend does make sense. You are firing larger diameter and heavier bullets than the .357. For such a round to be effective, you are going to have to put some force behind them and what you get from that extra power is more recoil. These results are worth noting, and we will come back to this and discuss in more detail in our application section of the article. Even for handgun rounds that often will not be shot at targets more than 50 yards away, ballistic performance of the cartridges is still important to factor into a cartridge comparison. 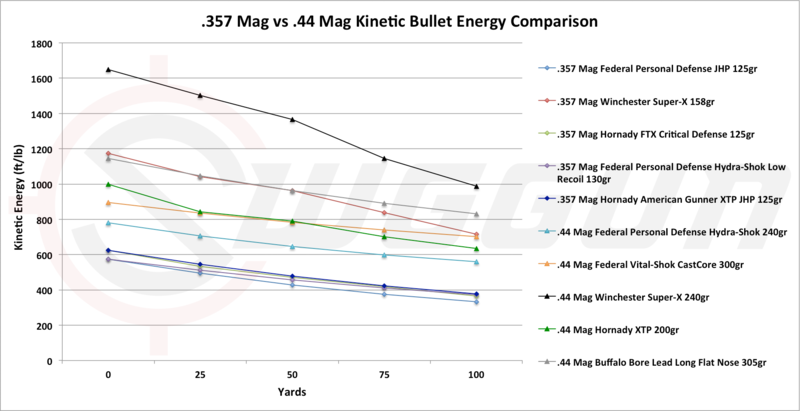 We will take a look at the velocity, ballistic coefficients, and the trajectory of the 357 Mag versus the 44 Mag to better sort these two cartridges into specific shooting applications at the end of the article. For the ballistic coefficients and the long-range trajectory, it might not be very insightful especially for those only looking at handguns, but some might be interested in their use with a carbine for larger game where the BC could be useful. The role that velocity has on bullet effectiveness, especially when it comes to home defense, is highly debated and the arguments can even turn a little nasty. What we know for certain is that velocity, along with bullet weight and design all entwine together to determine the rounds terminal performance and its ability to penetrate and expand and if you can deal with the recoil, an extra 100fps of velocity is never a bad thing. Perhaps the one drawback form having “too much velocity” comes with the potential for overpenetration, but you need extremely high velocities and a bullet that does not expand or fragment for overpenetration to be a real threat. Let’s take a look at the velocities (ft/s) of our ten rounds for comparison and see if we can draw any conclusions. While we have data points for out to 100 yards, most shots taken with a handgun are going to be well within 50 yards. What we see is that the velocity depends on the specific round that is being used rather than the cartridge. The largest of the .44 Mag bullets show the lowest velocities from the muzzle out to 50 yards which we would expect. Sending such heavy bullets downrange at the same velocity as lighter bullets would generate a recoil that would be unwieldy. Still, there are .44 Mag rounds that are as fast or faster than the .357 rounds out to the 50-yard mark, but you can expect some heavy recoil. If we were to average the rounds and compare the two cartridges this way, we would see an average higher velocity for the .357 Mag rounds out to the 100-yard mark, but the difference shrinks pretty rapidly once past the 50-yard mark. Regardless, all of the rounds have muzzle velocities well above 1,000fps and potential impact velocities 1,150 to 1,600fps at 50 yards. Paired with certain bullet designs, this is more than enough velocity to cause proper terminal expansion of the bullets. We do want to note that these numbers can fluctuate depending on the barrel length of your handgun. For this comparison, we used to designated barrel lengths that were designated by the manufacturer. The ballistic coefficient is a number generated from several variables that deal with bullet dimensions. What this number will tell you is how well a bullet is streamlined. The higher the ballistic coefficient, the better the bullet is at cutting through the wind with minimal air drag and less prone to wind drift. This also means that a bullet will hold it’s velocity better. Overall, a higher ballistic coefficient usually coincides with a bullet that is easier to put on target down range. We mentioned earlier that ballistic coefficient for handgun rounds normally does not warrant much attention from those shopping around, but both of these cartridges can be used with carbines where you might be taking shots at longer range. Because of that, we decided to take a look at how the .357 vs .44 Mag stack up against each other when looking at the BC. We have compiled the BC for as many of the cartridges as possible from the manufacturer and listed them here. The BC for the Buffalo Bore .44 Mag round was unavailable and omitted from this comparison and discussion. From this data, we see that there is not a huge and discernible difference between the ballistic coefficients when looking at cartridge vs cartridge. If we look at round to round we see that no matter what you go through these rounds do not have very good BCs. It is expected given the design of handgun rounds. A lot is going to depend on the design of the bullet and handgun rounds, especially those designed for defense just don’t have the shape needed to resist outside forces on their trajectory at long range. At the distances often encountered when using these rounds the low BC doesn’t mean anything and does not have any impact on getting rounds on target. If you do need something to give you more range, there are rounds designed for use with carbines that have much better ballistic coefficients. The trajectory is discussed with more fervor when discussing rifle cartridges, but there is something to say about it regarding handgun cartridges such as the 357 Mag vs 44 Mag. While the majority of shots are going to be taken at less than 75 yards with handgun rounds, we have mentioned that these are also two of the more popular hunting cartridges and you might find yourself taking a shot at 50+ yards. We have provided a graph to show the flatness of these trajectories over a range that encompassed 500 yards. Obviously, we are looking at handgun cartridges, and shots at 500 yards are not feasible. This is obvious when looking at 400 inches of bullet drop at these ranges. Now, most factory loads for a handgun can be used in a carbine chambered for the same cartridge, but there are some rounds designed specifically for use in a carbine and are better suited for long-range shooting. We will focus more on typical ranges handguns are used for shortly. You can still see the trajectories of these two similar rounds are similar and both show negligible differences out to 100 yards. You might be looking at 100 or 150 yards with a carbine, but that is the only scenario where we see this occurring. Let’s zoom in on this range and see if we can tease apart any differences in bullet drop (inches) between these two heavy handgun cartridges. We do see a slight difference between the two 357 Mag vs 44 Mag, but there is some variability between rounds of the same cartridge type as well. These differences are not very significant until you get out to the 75 and 100-yard mark. Here the heavier .44 Mag rounds show more drop overall than the .357 Mag rounds, though it is still only 2-3inches. We do have the Hornady 125gr XTP JHP show a pretty significant difference in the amount of bullet drop from the other rounds within the cartridge and this is even more noticeable when compared to the .44 Mag rounds where there is 5-6” less bullet drop. Both cartridges show very minimal loss in trajectory out to the 50-yard mark which means you just need to aim and fire with little thought of shot adjustment. This is valuable when using a handgun for defense or even hunting purposes. For cartridges to be used in home defense, stopping power is without a doubt, the biggest factor a lot of potential buyers are going to be interested in. Stopping power can encompass several different factors. Several of these include bullet penetration, expansion and the level of fragmentation of the bullet. Like we briefly mentioned earlier, velocity also plays a role how a bullet performs on impact. Not only this, but the energy that is transferred from a bullet to the target on impact also causes severe trauma to nerves, tissue, and organs. In this section, we are going to take a look at both the kinetic energy associated with the bullet as well as the penetration by examining the sectional density for each of the ten rounds we have selected. The kinetic energy that is carried by a bullet downrange is not the sole factor in stopping power, but it is important. This energy, once the bullet hits the target, is transferred over and caused massive damage to the surrounding tissue. What a lot of handgun owners want in a home defense weapon is maximum transfer of this energy which requires the right amount of velocity as well as expansion when it hits the target. Most of these factors are more of a comparison between the design of the bullet more so than the type of cartridge, but the amount of force that is carried by the bullet gives us a better comparison between cartridges. Because of that, we are going to look at the stopping power (ft.lb) of each of the eight rounds and see if we notice any trends between cartridges. 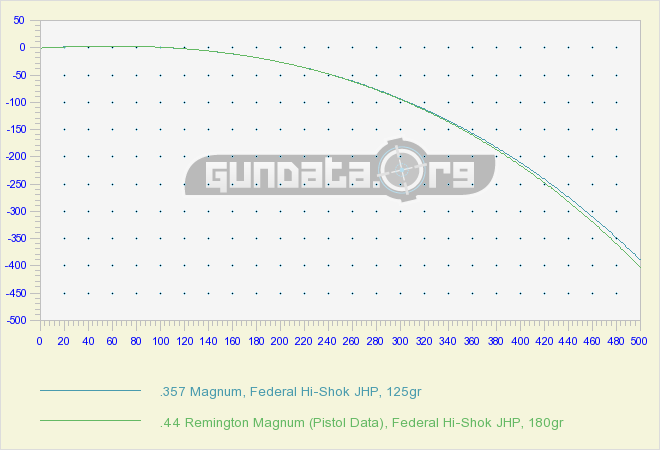 If we look at the graph, we notice that when thinking about the 357 Mag vs 44 Mag, the .44 Mag rounds we have chosen bring a lot more force with them than the .357 Mag. All but one of the .44 Mag rounds are carrying more than 600ft.lb of force at the 100-yard mark. This is an incredible amount of stopping power for a handgun round and will factor into what applications we feel this cartridge is useful for. All of the .44 Mag rounds carry a lot more energy downrange when compared to the .357 Mag rounds except for the single 158gr Winchester Super-X round. The higher grain weight of this round and the amount of velocity behind it bump it up to energy levels that are even higher than three of the .44 Mag rounds. Still, as a general pattern, .44 Mag rounds are going to carry more energy and in theory, cause a lot more damage to the target. With that being said, The .357 Mag rounds are no slouches either. Though less than the .44 Mag, the .357 Mag rounds are still around the 500ft.lb mark at 50 yards, which is still enough to penetrate and cause damage to targets. It also depends on the round. The heavier 158gr .357 Mag round performs more like the other .44 Mag rounds in force which we would expect given that force is determined by the mass and the acceleration. As we mentioned before, and is important enough to mention again, there is more to a cartridge’s effectiveness than the amount of ft.lb force it carries when talking about its ability to stop a target. While a lot of these .44 Mag rounds carry more energy than the .357 Mag rounds, it doesn’t mean the .357 rounds cannot stop an intruder. That is as far from the truth as you can get. Let’s take a look at another factor that goes into stopping power, the penetration. The best method for quantifying penetration without the use of ballistic gel is to look at the sectional density of the bullets for each cartridge. While gel can give us a lot of information, we’re not sure how well they replicate an intruder with heavy denim or a big brown bear tumbling down the hillside at you. The one benefit of looking at the sectional density for a cartridge comparison is that it takes out the other variables such as bullet design which spans across the cartridge type. We think it is a clearer picture as to how these two cartridges differ in their potential penetration. The sectional density is derived from the bullet’s weight and diameter. The higher the sectional density, the more force is applied to a smaller area which gives you better penetration. We should note that the bullet design also affects penetration. Rapid expansion and fragmentation will negate deep penetration. For comparison and simplicity sake, we are not factoring in these variables into our comparison, but do keep that in mind. So, let’s take a look at our eight rounds and see how the sectional densities of the bullets match up. From the sectional density data, we can see that the .44 Mag rounds are going to provide you with much more penetration than the .357 Mag rounds. This doesn’t imply that the .357 Mag has poor penetration for handgun cartridge. Though the .357 Mag rounds have a smaller diameter, the huge increase in weight of the .44 Mag rounds boost their sectional density. Not all of the .44 Mag rounds are drastically different from the .357 Mag rounds. The 200gr .44 round is more similar to the .357 rounds and is less than the largest grain .357 round we used in our comparisons.It’s quite the opposite. It’s velocity, energy, and sectional density all point to it having tremendous stopping power, just not quite as much as the .44 Mag. For handgun cartridges, especially in home defense settings, accuracy is obviously an important factor. Though it is important, putting numbers to accuracy for cartridge comparison is difficult to do. The reason is that so much depends on the firearm and more so on the person doing the shooting. And for these cartridges, you are taking shots at close range. We have seen from the velocity and the trajectory that you are not going to have to be making huge adjustments to your shot placement when firing a round. Even up to 50 yards, the bullet drop was minimal for both cartridge types. If for whatever reason, you are taking shots at distances greater than 50 yards, there might be a slight edge for the .357 Mag rounds as they showed on average a few inches less bullet drop than the .44 Mag rounds. Where there is going to be a major difference between these two cartridges when discussing accuracy has to do with recoil. The .44 Mag has a much more pronounced and severe recoil than the .357 Mag. If you’re not well practiced with handling the heavy recoil, they can influence your shot, and they will influence your ability to make quick follow up shots that are accurate, especially when you are in a situation where you need to protect yourself, and the adrenaline is pumping. Regarding ballistics and when used at normal handgun distances, there is not going to be much of a difference between cartridges. Between rounds, perhaps, but we don’t feel comfortable saying one cartridge is more accurate than the other. In the end, we think accuracy is going to depend almost solely on the one doing the shooting and how much experience and confidence they have with their firearm and the cartridge. Price is always a factor when thinking about buying a firearm, especially if you are still on the fence about exactly what it is that you need. For factory loads, the .44 Mag ammunition is going to be quite a bit more expensive than the .357 Mag rounds. The same goes for the brass when loading by hand. While there are rounds available that are cheaper and on the high end of the price spectrum for the 44 Mag vs 357 Mag, averages lean towards the .44 Mag is a more expensive cartridge. The availability of these rounds also differs. While you can find both of these cartridges in the major retail stores that carry ammunition, you are more likely to find more options for the .357 Mag. They are just more .357 chambered handguns and carbines in use than the .44 Mag. It’s not that you won’t find .44 Mag ammunition, but the selection is usually going to be smaller when it comes to the variety of rounds available. The same goes for the components needed to hand load rounds. Of course, with the internet, things have gotten much easier to get your hands on, but barring that, we think our position remains factual. 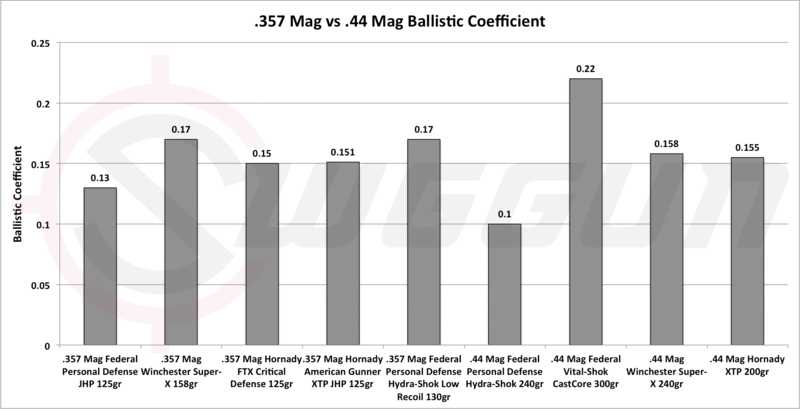 So now that we have all of the ballistic and other performance comparisons down let’s think about the applications of the 357 Mag versus 44 Mag. While a lot depends on the bullet, the .44mag will give you more security as a trail gun than the .357. The .44 mag with some heavy bullet loads is going to get excellent penetration on bear or other predators if you are out in the backwoods. While there are .357mag rounds that can fill the same role, overall the .44mag might be the better option. The much heavier bullets for the .44mag give a lot more penetration than the lighter .357 bullets and the force carried by the bullets is much greater at further distances which also make it a better choice for hunting or protection from larger game. With a carbine and at shorter ranges, the .44 Mag is even capable of taking the largest of North American game and larger game across the world. While the .357 Mag is also a suitable hunting rifle, it’s penetration might restrict it from some of the larger game the .44 Mag is suitable for. When thinking about home defense, both cartridges offer way more than enough stopping power for an intruder. Both are also in rounds with a variety of bullet type options that offer rapid expansion for large wound formation. The only drawback to the .44mag is the heavy recoil. For a lot of users, it is just too unwieldy to be able to provide quick shots with accuracy. Another factor to take into account for home defense rounds is the amount of penetration you get. Over penetration is often a fear in home settings where bullets might pass through the target and endanger others in the room or surrounding rooms. 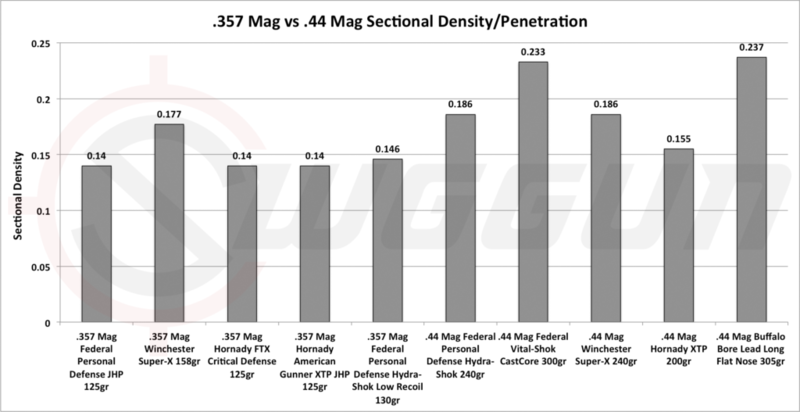 Just from sectional density, we saw that the .44 Mag has the potential for a lot more penetration than the .357 Mag, though we have to step back and remember that the sectional density is only part of the equation for penetration. The style of the bullet is just as important, and that is your decision. Most defense rounds are not going to penetrate like a hunting round for big game where you need to get through thick tissue and bone. With a defense round, over penetration should not be much of a concern for either round. Though the .357 also has a lot of recoil, it is not as pronounced as the .44mag, and there are rounds that offer less recoil while still providing enough stopping power. We give the edge to the .357 for home defense, but the .44 mag is more than capable when in the right hands. Handguns are also valued because of their ability to be carried on person in a concealed capacity in many States. Both of these cartridges require larger weapons to better manage the heavy recoil and might be difficult to wear comfortably in day to day scenarios. There are better options for concealed weapons chambered for the .357 though they are often smaller with a shorter barrel which makes the recoil pretty vicious. Before we wrap up this article, we wanted to take a look at the ten rounds we have examined and pick some of our favorite rounds for specific purposes. In this case, it is rounds for hunting, defense, and use on the range. This is just our preference, and you might find that you like something different for each category. As long as you are using them safely and have confidence in their effectiveness, that’s all that matters, and we wouldn’t argue with you. Looking at the .357 Mag rounds our pick for the top hunting/game defense round is the Winchester Super-X 158gr. The trajectory of this round is the only downfall of this round once you hit the 75-yard mark, but up until then, it has a flat trajectory. The reason we like this round for this category is the energy that it carries, which was the highest of the .357 Mag rounds, and the higher sectional density. This gives you much better-stopping power, and the soft point bullet gives a lot of expansion and wound creation. It might skew more towards game defense rather than hunting because of the trajectory at ranges greater than 75 yards. For our top hunting round, we like the Lead Flat Nose 305gr round from Buffalo Bore. This bullet is designed for deep penetration and expansion which is something you are going to want for dropping large game quickly. It’s pretty nasty recoil, but its stopping power and trajectory make it a fine hunting or game defense round. Our pick for the top defense round for the .357 Mag is the Hornady FTX Critical Defense 125gr round. The biggest reason we like this round is not something that we went over in the article. It all has to do with the propellant. The FTX hollow point expands reliably, even when penetrating heavy clothing and it uses a low flash propellant which is useful in dark, close-quarter situations. This round has one of the highest bullet energies of the .357 rounds but not much more recoil. All of these qualities give you a great and reliable .357 Mag round for home defense. For the .44 Mag, we like the Federal Hydra-Shok Low Recoil 240gr round. The biggest reason is because of the low recoil which we think is important for a defense situation. It doesn’t have the lowest recoil but for a 240gr bullet is very manageable. It has over 600ft.lb of force and a velocity over 1,000ft/sec at 50 yards. This is more than enough for devastating terminal effects. For just heading out to the range to gain hone your skills or just shake the rust off, you don’t want to burn through several boxes of expensive ammo that you will be using for use in real applications. While we think you should practice with some of those rounds, for general range purposes, you still want clean rounds that are reliable and not burning through your savings account. For the .357 Mag, we like the .357 Mag Federal Personal Defense Jacketed Hollow Point 125gr. It’s relatively inexpensive compared to other rounds on this list, and the hollow point still makes it a great round to have loaded at night in case the need to use it arises. With its recoil, you’re not going to get fatigued as quickly giving you more shots that are not wasted. For the .44 Mag, we recommend the .44 Mag Federal Hydra-Shok Low Recoil 240gr rounds. They are not the cheapest rounds on the market, but for their quality, we think they are more than a fair price. We hope that by now, you are convinced that both the .357 Mag and .44 Mag can be highly effective rounds both in the hunting and self-defense world. Both cartridge types have their pros and cons and excel at certain shooting applications. When used properly and in the right settings, both the .44 Mag and .357 Mag can be a joy to handle and shoot. We are sure there are some who will label one better than the other, but by looking at our modest comparison of the two, you can see that both have a spot in the shooting world for years to come.